Just before we came across that stunning flower on our walk at the Palace of Fine Arts, we captured this pair posing. It's a common juxtaposition on the grounds and we had been looking for just the right pose. Theater Arts. A 44mm focal length capture at f8 for depth, 1/20 second and ISO 400. 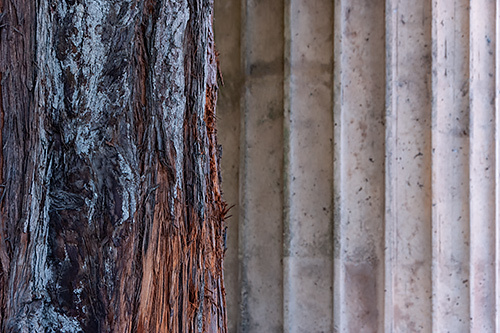 At f8, our depth of field was sufficient to keep both the bark and the column ribs in focus. We just had to decide how much of each to include. And since the familiar tree was in the foreground and the exotic column behind it, we settled on this arrangement as the most even-handed. Neither of these objects are much older (if at all) than 100 years. But they pretend to be thousands of years old. Theater arts, we usually mumble, laughing to ourselves. The Palace of Fine Arts is not just beautiful. It's beloved. And yet there were plenty of gushing patrons. Parties of people gathered for wedding shots or a quinceañera. Young couples on a date taking selfies. The tree was, no doubt, the original column, propping up some roof. The column, just as obviously, was the first permanent tree, weatherproof and enduring. Strength and durability both. Theater arts are an illusion, of course. Here today, gone tomorrow. The facades of city streets on the backlots of Hollywood. The undulating fabric on the stage standing in for ocean waves. When the curtain comes down, it all disappears. But what would we do without them? The party would have no birthday banner spanning the room. The cake no candles. No gift would sparkle with a ribbon. No bride would part a veil. No shoe would shine. No eye sparkle. Why wait two thousand years for beauty when a few will do?